Containing over 25 hours of educational material spanning 16 topics, this video bundle is the perfect learning tool for any caliber trader. 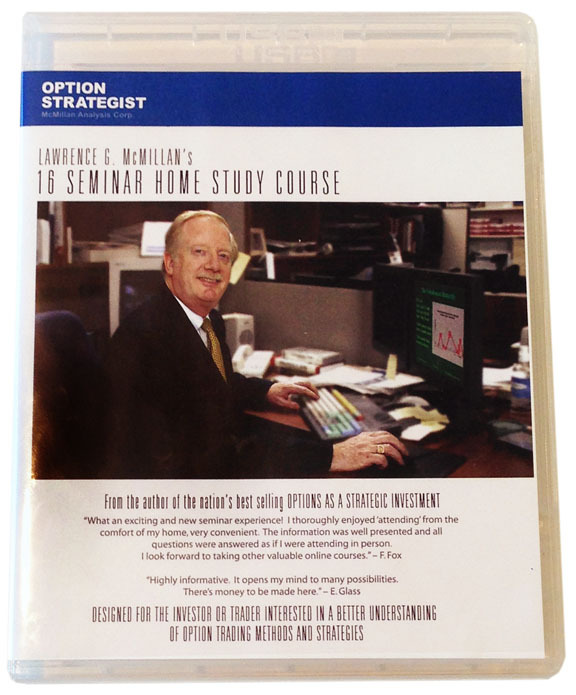 Divided into novice, intermediate, and advanced volumes, The Home Study Course promotes a comprehensive learning experience and is instructed by Lawrence G. McMillan himself. Each video is at least an hour long and includes audio and visual in a slide-show seminar format. All 16 seminar videos are stored on a handy USB flash drive. What underlying should I trade? Which option should I buy? How many options should I buy? Part 2: Products designed to produce "income"
Forward Skew -- soybeans, e.g. Reverse Skew -- $OEX, e.g. What does the bias mean? "The CD set I bought at the money show is worth 10 x the price. After years of working with options and stocks I have picked up more information from the CDs than in all that time. They really are great. The best thing is really how he identifies all of the pitfalls of all the option strategies and what works and what he thinks is a waste of time. His experience and comments are golden!" - If the auto-run prompt asks "What do you want Windows to do? ", click "Play" to play the videos. You can select the video of your choice from the Windows Media Player Playlist. Windows XP - Double Click the "My Computer" icon on your desktop, double click the "SEMINARS" drive, double click the folder of the seminar you want to view and then double click the .wmv file (i.e. option-basics.wmv) to play the seminar. Windows Vista / 7 - Click the Windows "Start" button on the bottom left of your desktop then click "Computer" from the menu. Double click the "SEMINARS" drive, double click the folder of the seminar you want to view and then double click the .wmv file (i.e. option-basics.wmv) to play the seminar.